MANILA, Philippines (CNN) -- A rescue vessel was expected to reach a stranded ferry with more than 700 people onboard by late Sunday morning (late Saturday night ET), the chief of the Philippines Coast Guard said. 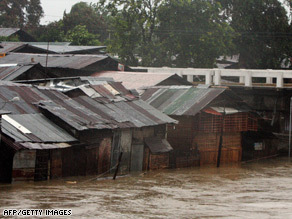 Homes in the city of Iloilo have been flooded after the arrival of Typhoon Fengshen. The MV Princess of Stars' engine failed near the central Philippine island of Sibuyan on Saturday during a regular run between Manila and Cebu City, Vice Adm. Wilfredo Tamayo said. As a result, the ferry -- carrying 130 crew members and more than 600 passengers -- ran aground in rough seas stirred up by Typhoon Fengshen, Tamayo said, and radio contact was lost. Typhoon Fengshen made landfall in the eastern Philippines early Saturday (late Friday ET) with top sustained winds of 110 mph (177 kph), although the storm lost strength after moving ashore. The storm, with 75-mph (120-kph) winds, was pushing toward Manila and dumping torrential rain across the Philippines, according to the Philippine Atmospheric Geophysical and Astronomical Services Administration.